I was asked some questions about the baptism of fire and soul contact. Since I have written quite a lot on this already I thought I would give some of the most pertinent extractions on the subject. Here they are. It is not good to put absolute faith in any being in the physical form whether it be Jesus, Buddha or Nero. The faith you must place should be on the Spirit of God within you that communicates with you through the point of Soul or interplay between Spirit and Matter – The Still Small Voice. The Spirit has this important ability. It can recognize truth and verify truth to whoever is seeking it with sincerity. The receiver of such truth may distort it and use it imperfectly, but nevertheless the Spirit is ever diligent to make sure the point of truth is verified to us. Now the Spirit is a Great Being who is Becoming on His own plane but relative to us he has achieved the “perfect” ability to verify truth in principle and on this you must put your trust. The beginnings of soul contact does not start with a bang. It starts with the “still small voice,” so still and quiet that you think you are imagining things when you first hear it. It is different than psychic impression which often comes through the astral body. Soul contact comes through the mind and heart (not astral emotions) working as one. The oneness of the mind and heart create a channel. After you pay attention to this contact the ability to recognize and trust it greatly increases, but it always takes a certain amount of faith to follow. The fire of the Spirit is a higher contact that comes in varying degrees but when this comes it is unmistakable and leaves no doubt in your mind hat there was definite contact with the energies of God. This higher contact comes for several purposes. One of the main ones is to give positive assurance that a certain direction is the correct one for you to take. Many will eventually receive this fire to confirm the truth about the Molecular Order and that they are to be a part of it. Then there will be those who have not yet received soul contact or the fire who will be deceived by lower astral fire. If one has not received the higher fire it is easy to conclude that the lower fire is the higher fire. When one receives the higher fire he knows that he has received it and knows that he knows. He can also recognize another who has received it and who is currently open to it. He who has received only the astral fire cannot discern the difference between the two. He believes be knows but does not know that her knows. Many people have their higher contact greatly delayed because of the deception that the astral contact is the ultimate. This keeps them from making the next step because they are not looking for it. 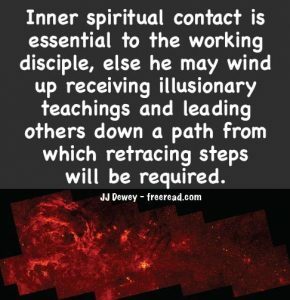 Soul contact reaches down through several reflections. Most of us have received some type of impression either directly from the soul or reflected through our mental or astral (emotional) bodies. Have you ever had a gut feeling to do or not to do a thing? Have you ever had an idea flash into your mind that just seemed right to you? Paying attention to these subtle impressions are guides that leads you to the still small voice, so still and so small (a zero point) that you will wonder if it is your imagination working overtime. But then if you have faith in this voice and follow it eventually the voice will seem as strong as a rushing of mighty waters and you will come into the oneness principle and know that you are never alone for you always have before you an association with others of higher consciousness who are one with the Voice. Great “summary piece”!!! Powerful, insightful & stimulating “foundational stuff.” Thanx!! !